Vizrt provides a variety of real-time 3D graphics including interactive and virtual solutions, animations, maps, weather, story and video editing, compositing, and multiplatform VOD and live playout tools for the broadcast industry. BOXX’s Vizrt systems are designed to tackle every task you encounter. BOXX designs and builds Vizrt hardware solutions optimized for leading media companies. Vizrt software covers a wide range of features and capabilities. Broadcasters who need to deliver world-class on-air graphics require Vizrt systems & hardware capable of supporting a variety of advanced workflows. Today’s on-air graphics employ the same type of 3D visuals found in feature films. The production of these assets requires a robust workstation capable of generating complex 3D models and animation generated by software like Vizrt. 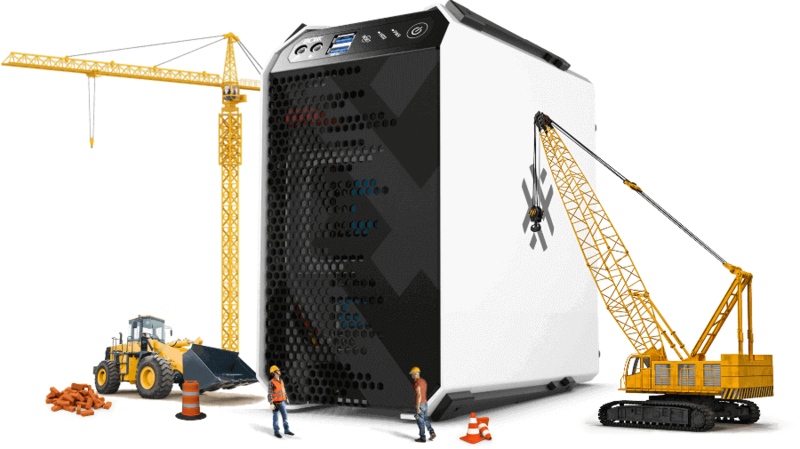 Whether you rely on tools like Viz Artist, or Cinema 4D, BOXX has you covered with the world’s fastest 3D production workstations and Vizrt-optimized servers. BOXX ProVDI™ solutions offer a unique scale-out approach to VDI which are engineering and optimized to maximize 3D productivity. Viz Engine is a powerful real-time Vizrt graphics rendering engine and the backbone of your graphics pipeline. Viz Engine requires a powerful, versatile and reliable hardware platform for compositing graphics and video from Vizrt’s suite of control applications and outputting them on air. Whether you require multi-channel compact rackmount servers for mobile broadcast vehicles, or traditional workstation towers, BOXX has an optimized Vizrt hardware solution for your workflow and environment. Supports up to 44 total cores (88 threads) with dual Intel® Xeon® E5-2600v4 series processors,in a small form-factor (20" deep) rackmount 3U design with room for up to 4 GPUs. BOXX APEXX 5 rackmount servers offer optimized configurations for Vizrt that feature dual CPU for multi-threaded tasks, or a single overclocked CPU for lightly threaded applications. All APEXX 5 rackmount models feature support for at least 4 GPUs and dual redundant power. For space constrained broadcast environments, select APEXX 5 models are available in a 20” deep chassis. BOXX engineered these models based on customer feedback who have limited space in legacy AV racks or mobile broadcast vehicles.